Visit North America's premiere racing simulation centre, which brings the thrill and experience of racing to Montreal - a city immersed every summer in the excitement of the Canadian Grand Prix. Experience up to eight professional-level simulators identical to those used by top Formula 1 teams to train their pilots. From first timers who want to know what it's like to be in a race car, to professional racers who want to practice in the most realistic setting possible, you can sit in the driver's seat and feel the extraordinary rush of adrenaline unique to the sport. 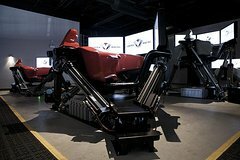 Experience the first racing simulator facility in North America with 8 simulators as used by professional F1 racing teams to train their drivers. You can drive solo or against up to 7 other drivers in competition in F1, GP2, GP3, F3, high performance cars, etc. This initiation package generally takes 1-1.5 hours and includes a 20-minute introduction to racing a Formula 1 car. Learn how to race on the simulators. Get behind the wheel with a 15-minute session on the simulator, a telemetry report and a review of the race with the instructor afterwards. The races underway are displayed on big screen projectors so that you can enjoy watching the race in the comfort of the cafe area, where drinks and snacks are served. On-site free parking is available. The minimum height requirement is 5 feet and adult consent (18+) is required for minors. © 2019 Hello Montreal - All Rights Reserved.